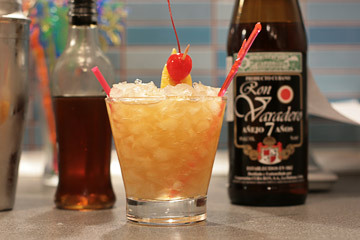 Posted on May 12, 2008 October 31, 2010 by Pavel Y.
MxMo Rum: Mai Tai – roa ae! The theme of this MxMo – Rum! Rum is my favorite alcohol beverage now. 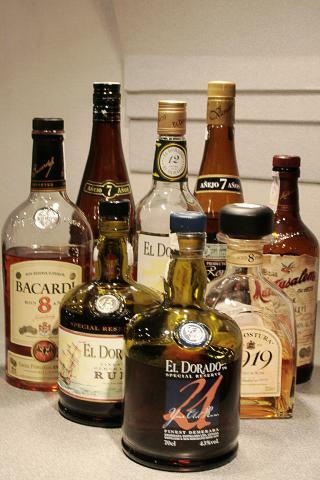 I have many bottle of rum in my bar and use it every so often. Aspecially I like aged rums and the best cocktail with aged rum – Mai Tai. 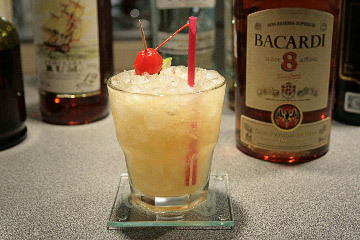 Mai Tai is most famous tiki-drink, which was invented by Victor J. “Trader Vic” Bergeron. This monumental cocktail has many own lovers and fans. Actually, a properly made Mai Tai is great and potent drink and I want to give some information about my Mai Tai for you! The basic idea of Mai Tai is “Creating a drink that would be the finest drink we could make, using the finest ingredients we could find.” It is great words! Shake all with a lot of cracked ice. Serve in apropriate rock glass with crushed ice. Garnish with a lime shell, cherry and mint sprig. 1. Mai Tai is NOT red, NOT blue or green! It contains NO grenadine, NO coconut rum, NO pineapple juice from can! Only fresh squeezed lime juice! 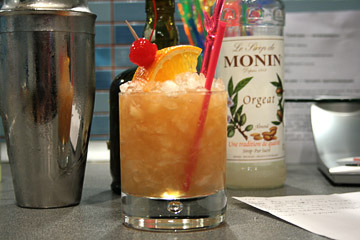 Mai Tai has from light to dark brown colour. 2. The garnish is variable. 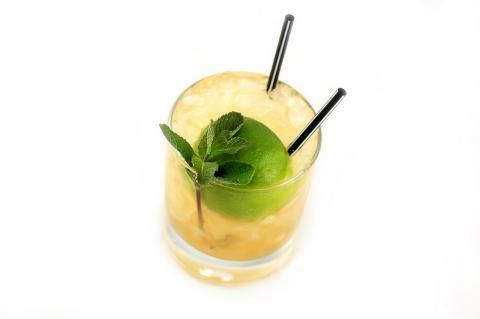 You can to garnish yours Mai Tai with orange wedge and maraschino cherry (flag) (as Jeffrey Morgenthaler), with lime shell and sprig of mint(as Trader Vic) or exotic flower. 3. Use only best aged rums for Mai Tai or blend of the same as. 4. Use only best ingredients for Mai Tai. 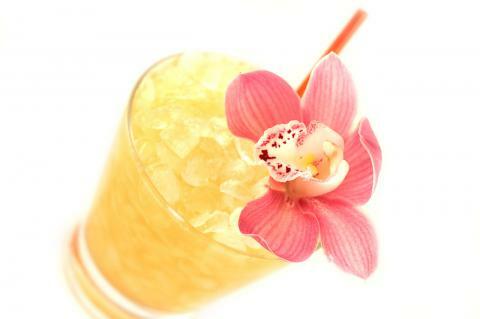 Good choice is Orgeat by Monin and orange curacao liqueur by Bols or Marie Brizard. 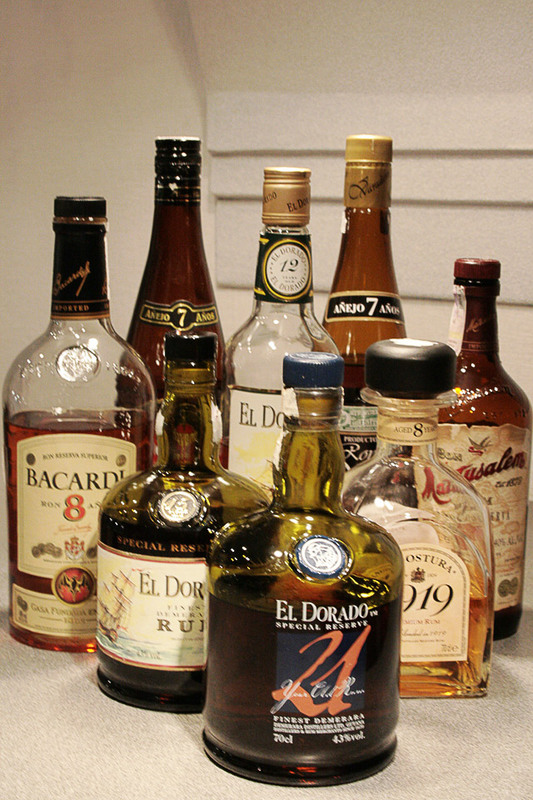 Do NOT use Amaretto instead Orgeat, but Cointreau instead curacao work well with some rums. Mix sugar and boiling water and stir untill sugar disolved completely. Strain syrup in bottle with vanilla extract. Keep fridge. 6. Use only fresh ripe limes for Mai Tai. Do NOT use lime juice from can or something like Roses Lime. 7. 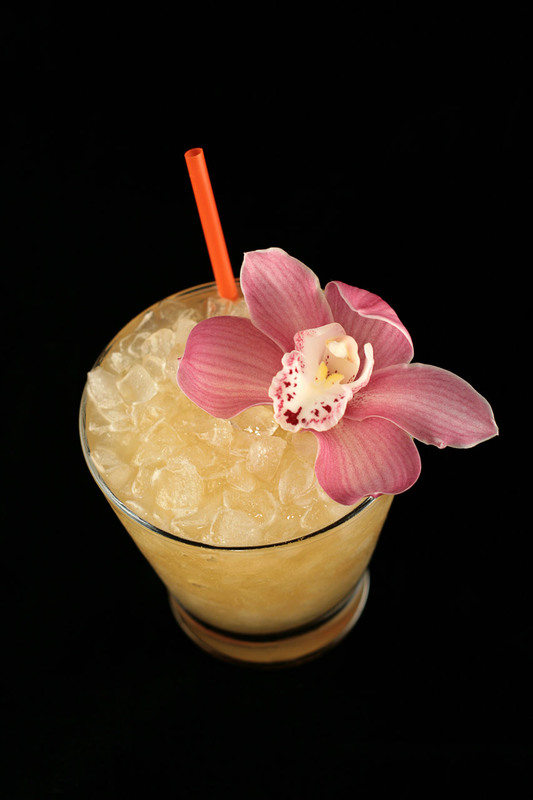 You MUST use a lot of cracked ice in shaker for proper Mai Tai. The drink must be very cold. You can add cutted lime shell in a shaker (as recommend a guru of tiki-drinks Jeff Berry) for very smooth and refreshing results. 8. As Jeffrey Morgenthaler wrote “When made properly, the Mai Tai is a smooth, slightly sweet, and potent concoction – and well worthy of our sophisticated palates (heh).” As for me, I think that Mai Tais taste is rich, interesting and bright. Varadero 7 y.o. is one of my new rums. It has no site in www. 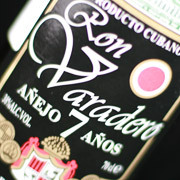 Varadero Anejo 7 Years is a rum from Cuba. It is a brown color rum and aged for 7 years. Relatively inexpensive – my 0,7 l bottle cost about 20 USD. This rum has no own site, that is not surprising – rum produced in Cuba. This rum has right rum aroma and sweet, light taste with some molasses and vanilla note. Varadero 7 y.o. is pleasant drink, but no more. Looks like the Varadero 7 y.o. 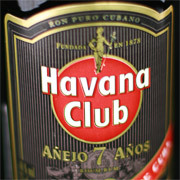 is false Havana Club 7 y.o. – good but not amirable. Cocktail Mai Tai with Varadero 7 y.o. rum has smooth and very sweet taste, but not interesting. Тhe taste is no very bad, but no good for me. In my opinion this rum is no good choice in Mai Tai (single). It is legendary aged cuban rum. The real masterpiece of rum distiller art. Great and sophisticated things. Havana Club 7 y.o. has rich, cognac-like aroma with deep and little smoky aromas of coffee and tobacco. In taste are some molasses, vanilla, chocolate and coffee with dry and woody finish. 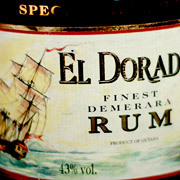 The rum has refined, complex and rich smooth taste. Actually Havana Club 7 y.o. 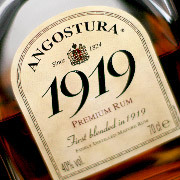 is one of my favorite siping rum. Mai Tai with Havana Club 7 y.o. has smooth, interesting sweet taste. The rum taste is so uncertain… Undobtedly is great drink but… But I prefer to add some drops of Angostura bitter in my Mai Tai with this rum for more bright taste. 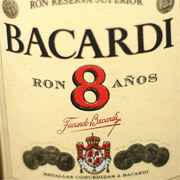 This rum is pride of Bacardi family. First aged rum from Bacardi company is so interesting thing, on my opinion. A good “rum” nose of this rum has some mokasses, vanilla and caramel undertones. The taste is a little harsh and warm, but bright. The aged, woody notes are so ulterior. In taste are fruit tones and vanilla. This so aromatic rum is good on the rocks, but so harsh from snifter. The Mai Tai with this rum has very sweet taste. The rum taste is so weak and no interesting. As single rum Bacardi 8 is no good choice for Mai Tai. It is great heavy rum from Trinidad. This extraaromatic rum has very rich, big flavor – sweet molasses, vanilla. The fullbodied taste with warm and sweet notes of molasses, caramel, brawn sugar is very pungent. This rum has live, active character and I like it very much! This rum great for siping, especially with some ice. 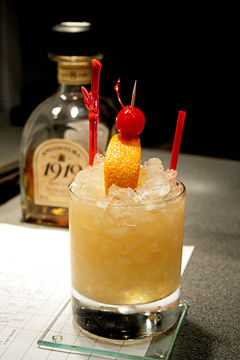 The Mai Tai with Angostura 1919 has great aroma and very interesting rich and piquant taste. Тне taste is so more sweet, and I recomend to increase amount of lime for this rum. 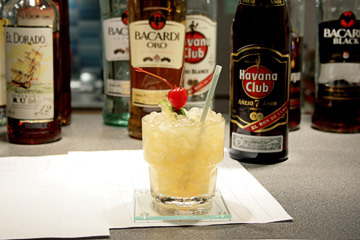 The rich sweet taste of rum play first role in this drink. Exellent cocktail! 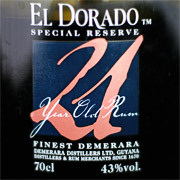 First of my favorite Demerara rum – El Dorado 12 y.o. Great rum for cocktail or siping. This rum has complex and interesting taste and aroma. The nose is spicy and fruity but with aged notes. Round, full body taste with powerfull notes of fruit, tabacco and orange peel. In aftertaste we feel very balanced aged notes of oak, leather. Excelent! Very balanced slightly sweet and very refreshing bright taste! Undoubtedly is real and great ingredient for Mai Tai. It is one more “cuban” rum. Now Matusalem produced in Dominicana for USA-office. Great old rum produced with unique solera-method of aging. Refined, very balanced nose with note of vanilla, caramel and plums. It look like expensive parfume. Delicate taste with an exceptional bouquet with vanilla, molasses and caramel notes. This rum has very male character. This rum close to Havana Club 7 y.o. and recommend for siping. 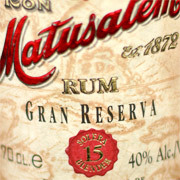 The Mai Tai Cocktail with Matusalem Gran Reserva is very interesting and unusual Mai Tai. The taste of rum is no so bright, but cocktail has bright orange taste. Sweet, citrus and very refreshing cocktail. My second aged Demerara rum. It has bright full bodieb taste and rich aroma. In nose this rum has composition of cedar, fruit (banana) and sweet (molasses, brown sugar) notes. Very rich and complex taste with bright notes of oak, dry caramel and tropical fruit. In deep taste we can find very interesting scotch-like smoky notes. Very strong and rich rum. Great rum – great result. Perfect balanced cocktail with great rum taste. 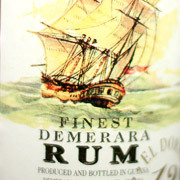 Really, this rum is unique masterpiece of demearara plantators. This rum is glorious, admirable drink. Full bodied, high aromatic rum surprise me with extremely smooth and rich taste. Very potent, bright, charismatic rum. The nose of this rum very complex, we can find notes of exotic fruit, leather, cocoa, coffe, molasses, vanilla, brown sugar, orange peel and more! Extremely rich sweet taste has delicious note of dried fruits – raisin, prunes, dried apricots, also aging notes of tobacco in ocean of sweet molasses, caramel, vanilla notes. Long warm and sweet aftertaste with liquorice notes delivering a long lasting sensation. It is realy a Big Rum. 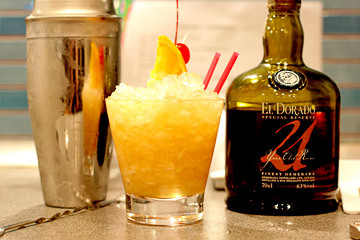 The Mai Tai with El Dorado 21 y.o. is grandiose and fascinated drink. Perfectly balanced, very rich and interesting drink. I do not know the taste of original Mai Tai with Jamaican 17 y.o. rum, but I am sure that this drink no worse. 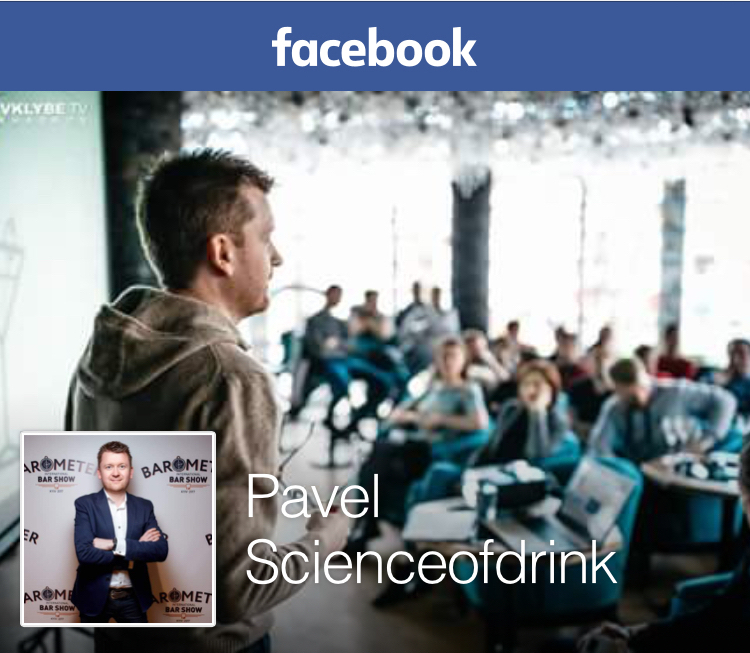 Hi Pavel, couldn’t respond to your e-mail, so thought I’d post here. too! Outstanding job, and nice rum reviews. It’s a two for one post! Just Great! 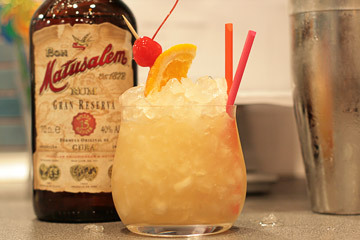 as a real Mai Tai geek i`m really happy to see your entry together with those nice rum reviews! I have made quite a few Mai Tais with different rums but i didn`t know it could taste like this..or the full meaning of “Mai Tai roa ae” until i made it with the Silver Seal 15 year demerara rum. Shake with ice, strain and serve over crushed ice in a double old fashioned glass, garnish with a sprig of mint, and a cherry. 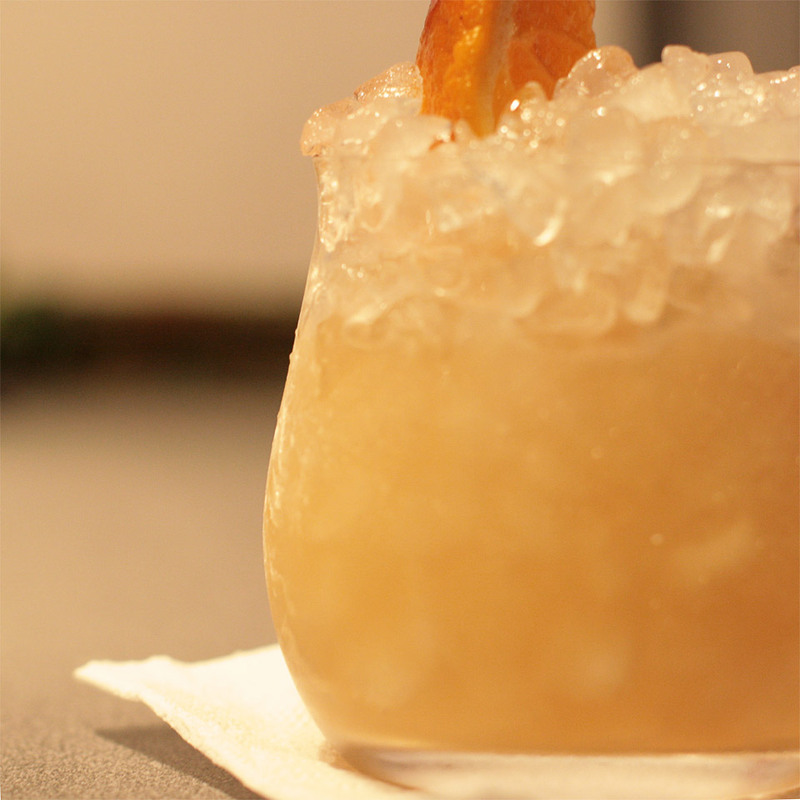 This Mai Tai packs a punch due to the 110 proof rum. Сегодня опробовала Май Тай с семилетней ангостурой, это восторг, мне и раньше нравился этот коктейль, но не было в арсенале выдержанного рома. Не являюсь поклоницей крепких напитков в чистом виде, но этот ром меня очень удивил такое долгое приятное послевкусие, а как он пахнет, лучше любого парфюма! Я так понимаю можно отнести его в группу темного рома? Теперь нужно подобрать пару, хочу прикупить Гавану 7-летнюю благо ее гораздо проще достать. 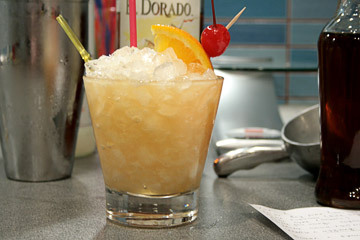 The use of Creole Shrubb instead of Curacao/ Triple Sec is awesome in the Mai Tai. I like .75 Oz of it and then no need for sugar syrup. Makes a very luscious​, fruity Mai Tai. You’d be excused.for thinking the cocktail is made of multiple fruit juices like pineapple and cherry.